Today marks four years since Rebekka Meyer was killed riding her bicycle to university, as she attempted to negotiate the intersection of Stanley St and Annerley Rd. A key recommendation from the Coroner who investigated that tragedy was for Brisbane City Council to build more protected cycleways across the city. In other cities around the world, terrible incidents like this have at least provided impetus for change. But here in Brisbane, bikeways seem to remain political footballs, with the LNP dominated Brisbane City Council and the Labor state government pointing the finger at each other, while cyclists are left in no-mans land, and many people are hesitant to ride at all. The location where Rebekka was killed is part of the proposed “Woolloongabba Bikeway” which cycling groups have been calling for for over a decade. In late 2015, Bicycle Queensland went as far as commissioning a transport consultancy firm to produce plans for a separated cycleway along Stanley St, linking the Goodwill Bridge to The Gabba. 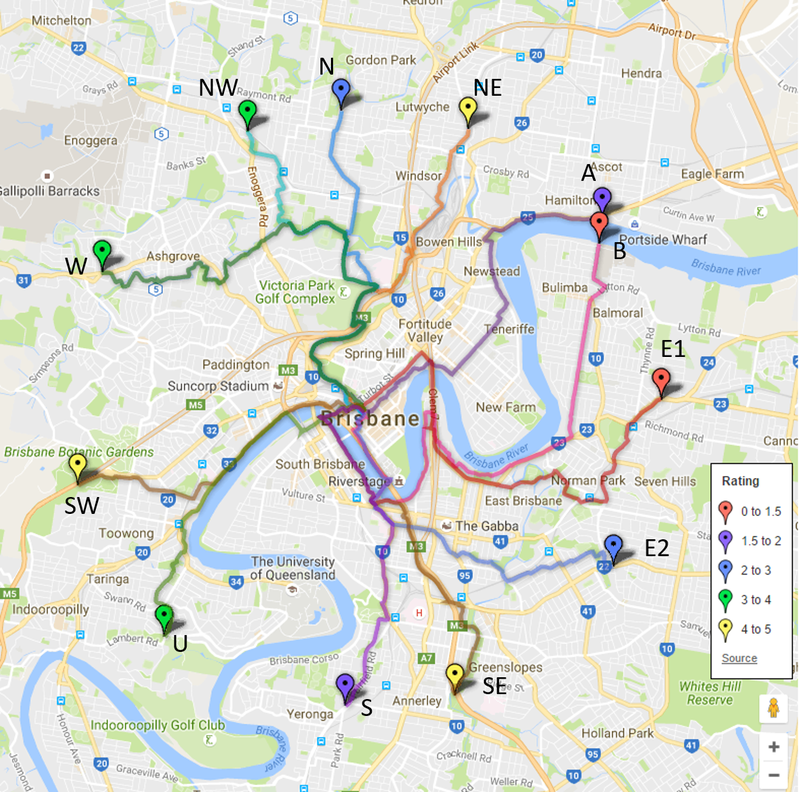 In the lead up to the 2016 Council election, local and mayoral candidates from each of the LNP, Labor, and The Greens agreed to proceed with the bikeway if they won office. Council is in negotiations with the Queensland Government’s Department of Transport and Main Roads to close the South East Freeway on‑ramp from Stanley Street. That was no surprise, as the closure of the slip lane from Stanley St was proposed in the earlier reference design, which Council circulated in early 2017. Council held community information sessions on the final design on 5, 7 and 9 September 2017 – each session lasting for 3 hours. These sessions were well advertised, highly visible, and well attended – including by staff from TMR. It was only after a meeting with South Brisbane residents apparently disgruntled with the Kangaroo Point Bikeway, that the Deputy Premier Jackie Trad MP and Main Roads Minister Mark Bailey suddenly kiboshed the plans, claiming that the relevant authorities were not aware of the proposed slip lane closure. At that time, some misinformation circulated that the plans required complete closure of the motorway on-ramp – when in reality they only required closure of the slip lane from Stanley St. Signs on that slip lane advise that it is not to be used between 4:30 and 6:30pm, but in fact that is when the majority of vehicles use it as a convenient way to skip the queue onto the motorway. The slip lane from Stanley Street is very little used outside these times, and motorists have a number of alternatives, including an 800m loop via Allen St and Leopard St, or further south via Juliette St using Ipswich Road. We are particularly concerned that the Deputy Premier has overruled a plan in her own electorate that was agreed by traffic engineers from both Council and TMR, and which was put to the community for consultation. We consider the resultant delays to the bikeway, and any changes that will compromise the safety and convenience for people walking and cycling, have been made for political purposes. We are asking that the original plan (including the closure of the part-time slip lane) be reinstated, and work on this critical project be commenced immediately. A petition to Queensland Parliament has already gathered over 450 signatures, and dozens of residents have contacted their local MPs to express frustration at the state government’s eleventh hour interference with this project, and the ongoing delays. In comments on Facebook, Minister Bailey has reflected responsibility back on Council, via Deputy Mayor Adrian Schrinner. As someone who rides to work this way daily, and would like to be able to ride a safe route home at least as far at Woolloongabba, I’m sure I speak for many people in expressing impatience: Enough of the finger pointing; just get on with it! Please add your voice by signing our petition, at this link.